For your next martini, keep those tasty olives properly submerged at the bottom of the glass in a fun nautical way with these cool new Anchor Cocktail Picks. 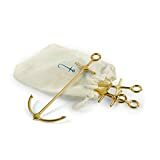 Rather than the typical boring old toothpick or plastic pick, these reusable miniature stainless steel ship anchors with a gold metallic finish can hold olives, cocktail onions, or cherries on each anchor tip. The only thing that's missing is a tiny chain to haul it up. They come in a set of six in a mesh storage bag and are perfect for boat parties, beach parties, backyard luaus, or just anytime because they're so cool.